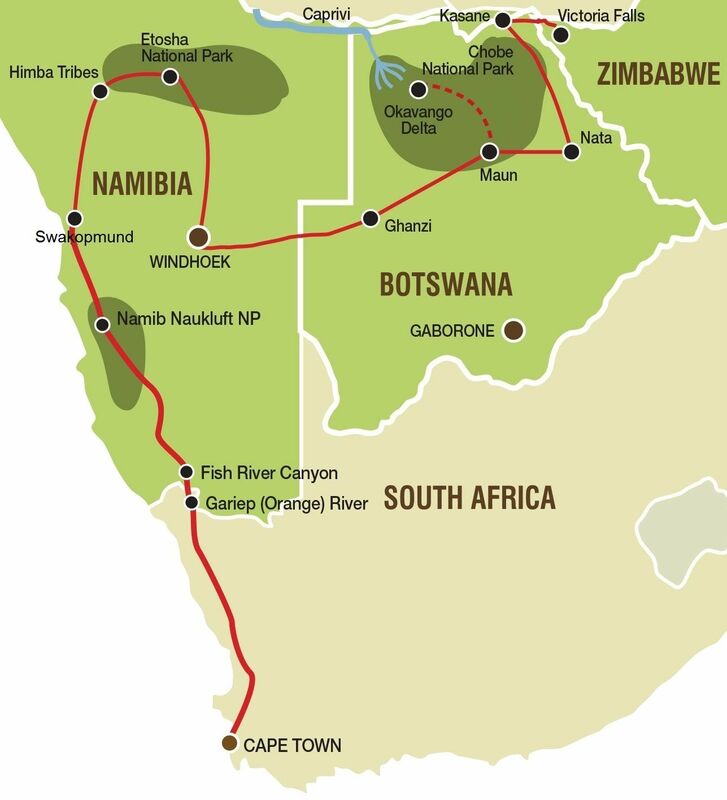 This overland tour from Victoria Falls to Cape Town was designed for those who prefer a bit more comfort while travelling in Africa. Clients overnight in comfortable twin rooms in hotels/ lodges or permanent safari tents. All rooms offer en-suite facilities with hot water showers and “normal” toilets. This is of course still a tour with an adventurous nature and the accommodated option should be seen as an upgrade of the camping option. On this tour highlights will include safaris in the national parks of Chobe and Etosha and we explore the Okavango Delta, the spectacular deserts of Namibia and one of the 7 natural wonders of the world- the Victoria Falls in Zimbabwe… to name just a few. As the tour name says, your safari from Victoria Falls to Cape Town starts in the town of Victoria Falls in Zimbabwe. Today is your arrival day in Victoria Falls and you will be able to visit the spectacular Victoria Falls at your own leisure. The bustling adventure town of Victoria Falls also offers a range of optional activities for those wanting a dose of adrenaline. For the more relaxed traveller there are craft markets to explore and a delicious high tea is on offer at the Victoria Falls Hotel. After breakfast we travel the short distance to the Botswana border, crossing into Botswana to our lodge on the banks of the Chobe River. For those who have purchased the activity package we begin our exploration in 4x4 vehicles and enjoy an afternoon game drive (safari) through the Chobe National Park followed by a boat cruise in the afternoon, which allows us an up close and personal experience with the many elephants that frequent the Chobe riverfront in the afternoon. Leaving Kasane early, we set off for Nata where we will overnight. Our activity package will afford us the opportunity to enjoy an afternoon guided excursion to the Pans and Nata Sanctuary to appreciate the spectacular view and a sundowner (drinks around sunset). Our tour today takes us across the northern reaches of the Makgadikgadi Pans and the road to Maun is lined with majestic views of the iconic Baobab tree. Upon arrival in Maun, you will have the opportunity to enjoy an optional scenic flight over the Okavango Delta (time and weather permitting – this could take place on day 6). We start early this morning as we travel west and cross the border into Namibia, travelling onwards to the capital city of Windhoek. Upon arrival in Windhoek, we will take a short walk through the city centre and have the opportunity to view some its better known landmarks. (Our accommodation for the night is situated halfway between the city and the airport). Leaving the city of Windhoek early, we have a full day of driving ahead of us and will reach the gates of Etosha National Park in the late afternoon. We begin with our first game drive (safari) as we enter the park and travel the short distance to our overnight rest camp for the night. Etosha is the venue for some of the most unique game viewing experiences in Africa. Today we have a full-day to explore the edges of the Etosha Pan in search of the abundant wildlife that occurs in the park. Our overland truck offers us an elevated platform and we will spend some time at the many waterholes dotted throughout the park. We will rise early and enjoy our last safari through Etosha as we make our way to the gates and exit the park. Sit back and enjoy the scenery of rugged mountains and dry river beds. Our exploration continues with a visit to the Giants Playgrounds, named for the way in which the massive dolerite boulders have been placed on each other- creating rock formations and a series of mazes. We board the truck and travel south on the gravel byways of Southern Namibia on route to Ais-Ais. Famed for its hot springs the resort and its hot pools are the perfect tonic to ease away the dust of the Namib. The Fish River Canyon is one of the largest in the world and this afternoon we take a walk along the rim of the canyon and end our day with a memorable sunset on the canyon edge.